Goal keepers; Dennis Onyango (Mamelodi, South Africa), Salim Jamal (El Merriek, South Sudan), Benjamin Ochan (KCCA, Uganda), Ismail Watenga (Vipers, Uganda). Defenders; Nicholas Wadada (Vipers, Uganda), Denis Iguma (Al Ahed, Lebanon), Joseph Nsubuga (SC Villa, Uganda), Isaac Isinde (Simba, Uganda), Rashid Toha (Onduparaka, Uganda), Timothy Awany (KCCA, Uganda), Halid Lwaliwa I(Vipers, Uganda), Joseph Ochaya (KCCA, Uganda), Godfrey Walusimbi (Gor Mahia, Kenya). Midfielders; Mike Azira (Colorado Rapids, USA), Geoffrey Kizito (Than Quong Ninh, Vietnam), Aucho Khalid (Baroka, South Africa), Ivan Ntege (KCCA, Uganda), Moses Oloya (Kuban Krasnodar, Russia), Tonny Mawejje (Knattspynufelagio prottur, Iceland), William Luwagga Kizito (Rio Ave, Portugal), Abdul Malik Vitalis Tabu (SC Villa). Strikers; Hamis Kizza (Free State Stars, South Africa), Geofrey Masa (Baroka, South Africa), Emmanuel Arnold Okwi (Sondjerskey, Denmark), Yunus Santa (Iives, Finland),Farouk Miya (Standard Liege, Denmark), Erisa Ssekisambu (Vipers, Uganda), Muhammed Shaban (Onduparaka, Uganda), Edrisa Lubega (Proline, Uganda). Most of the usual suspects especially those that participated in the historic AFCON qualifier game against Comoros on Sunday, 4th September at Mandela National Stadium like Farouk Miya, Emmanuel Okwi, Geofrey Masa and Denis Onyango saw themselves as Micho’s favourites. What attracted the attention of local soccer pundits and local football die hard followers was the inclusion of Onduparaka’s defender Rashid Toha and their forward Muhammed Shaban into the Micho’s strong side. 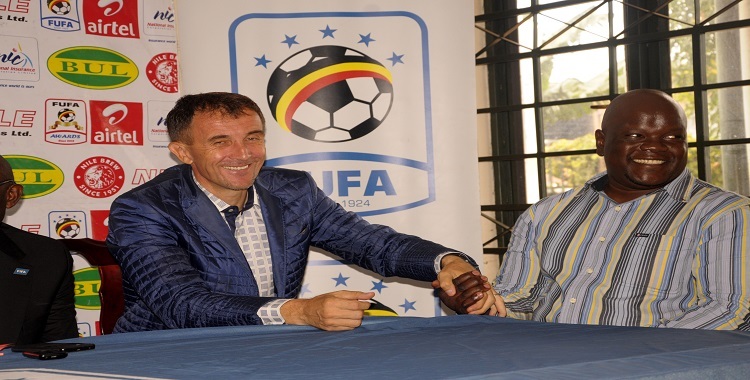 In fact if none of Onduparaka’s players was included in the Cranes squad, Micho would be compared to an English football pundit who selects his 2015/2016 best player without picking any player from Leicester City. ← Chelsea win in extra time as Arsenal and Liverpool thrash opponents.